It just wouldn’t have made any sense if we didn’t throw the most amazing birthday party for the person that is always by my side and supporting me in everything that I am doing. It was his birthday that started this blog, so this was my way of showing him that I appreciate it. Not only is he the best investor, my best friend, my partner in crime, but he is the person I am lucky enough to spend the rest of my life with. It was so tough keeping this all a secret and not telling him anything, I feel so much better now! To surprise him and celebrate his special day I brought some of his closest friends all together. Let’s just say he was speechless! 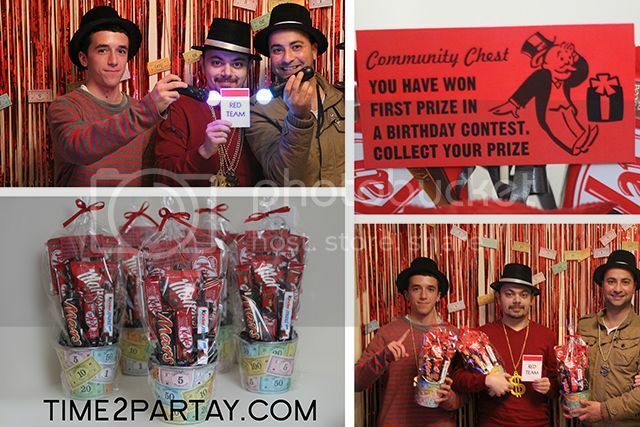 The theme was a Monopoly game night since he loves playing board games. 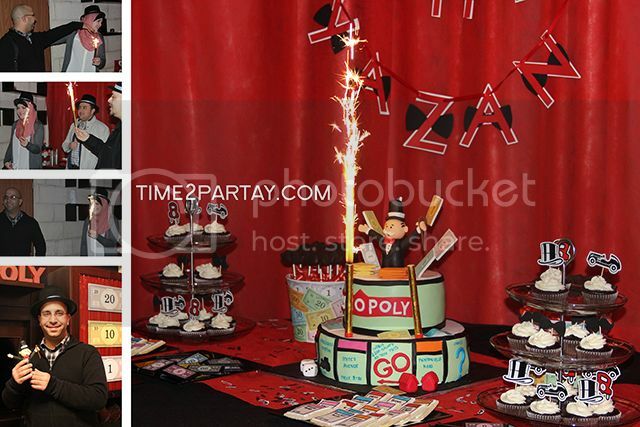 I decided to make the decorations based on the Monopoly board game since everyone is familiar with it. 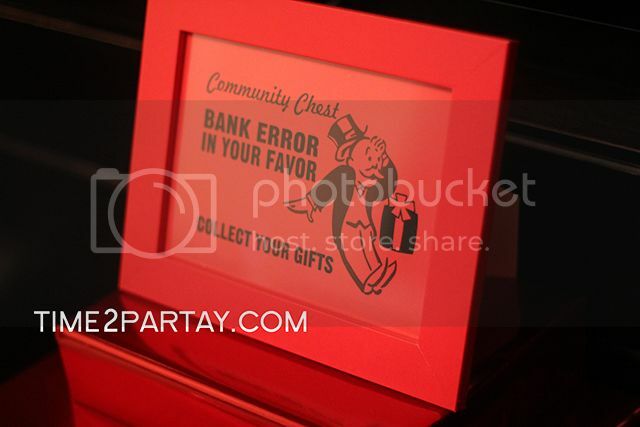 We used Monopoly money, the frames and instructions were like the Monopoly “Chance” and “Community Chest” cards. 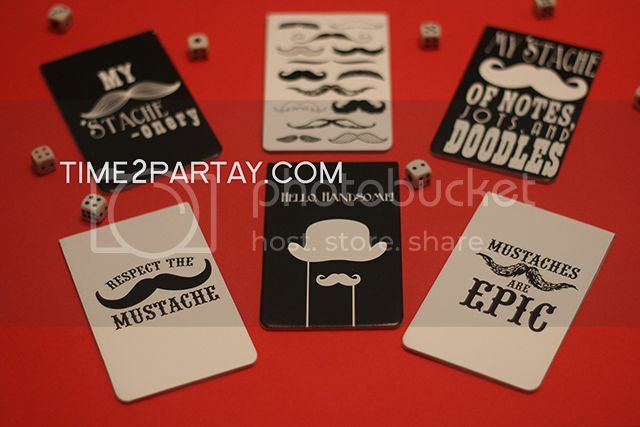 I added a lot of hats, mustaches, and bows to match Mr. 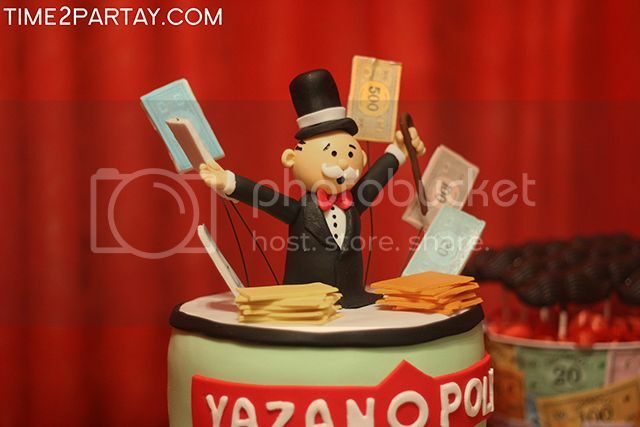 Monopoly or Rich Uncle Pennybags. There were decorations, a lot of competitive games, sweets, pizza, food, favors, and gifts for the birthday boy and even the winners! 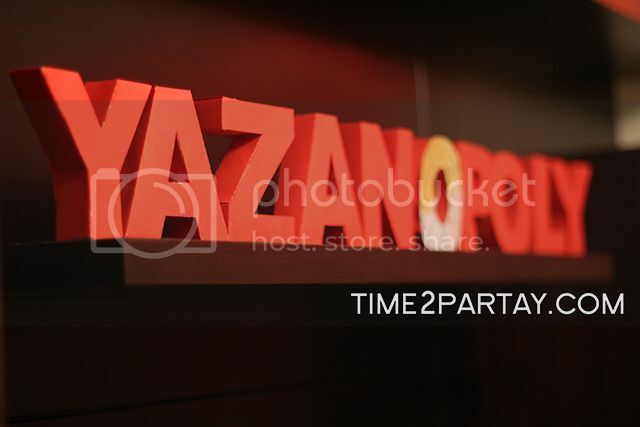 I love you Yazan and happy early birthday! 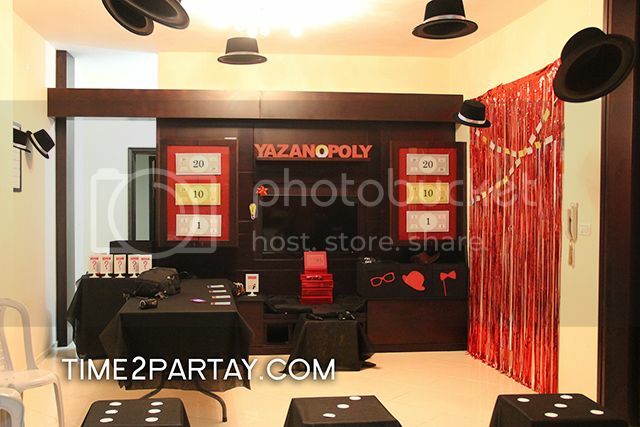 Hope you enjoyed your Yazanopoly game night birthday party! 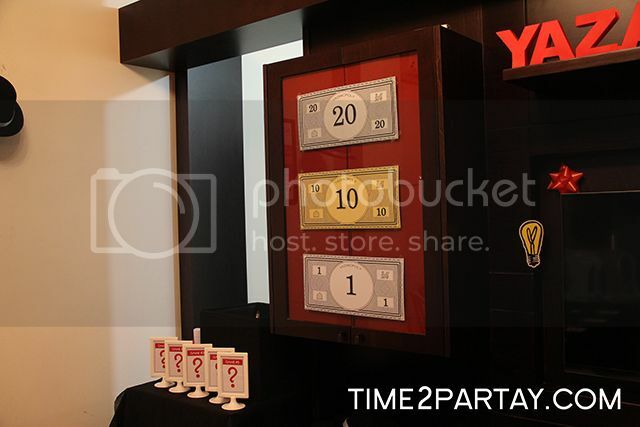 This was the invitation I made and sent to all of the guests. 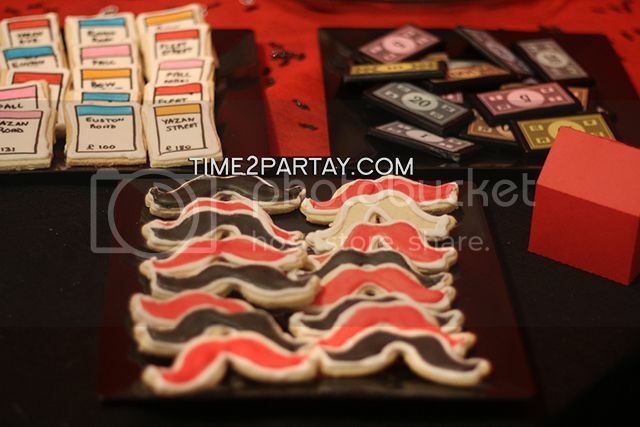 Check out the slideshow below for all of the pictures! 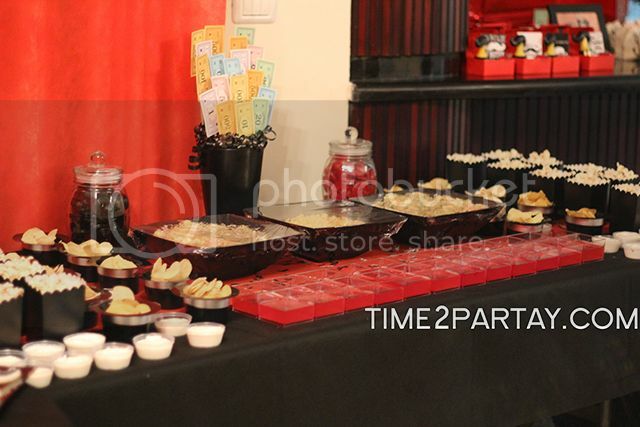 We set up a table for the sweets, food, silverware, and drinks. 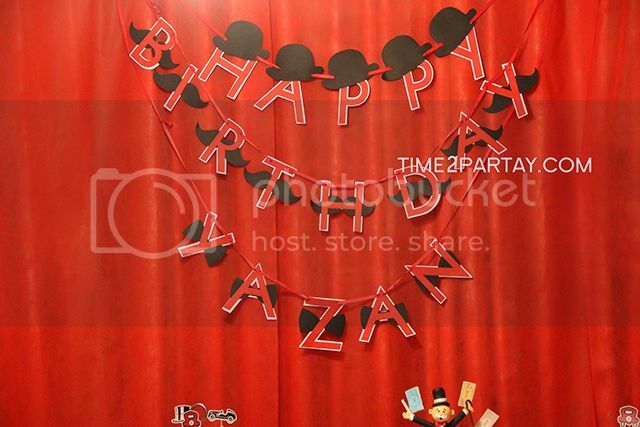 We made a banner using hats, mustaches, and bows. 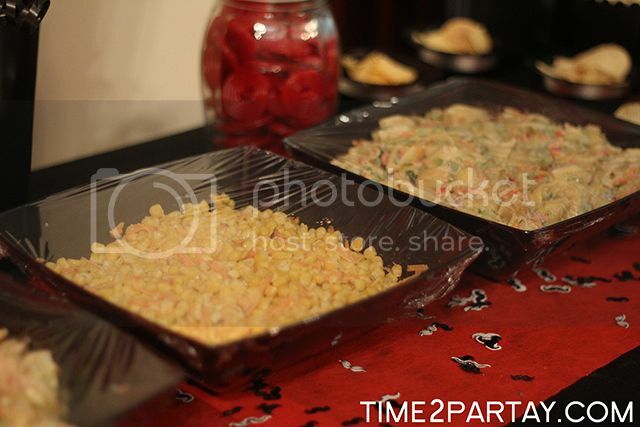 It looked perfect with the decorations and food. 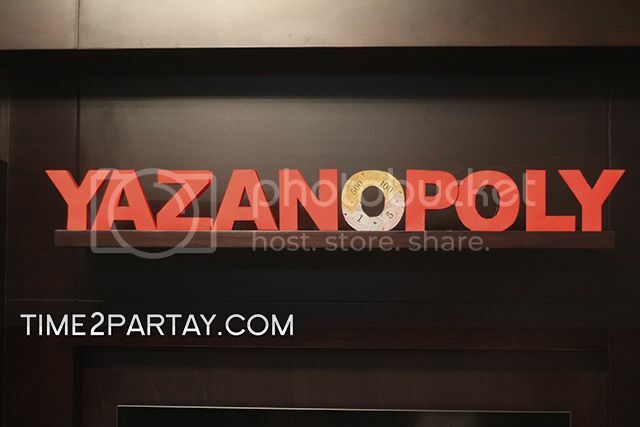 I added Yazan’s name to the banner to make him feel super special. Surprise! We sang happy birthday right when he came in. He was speechless! 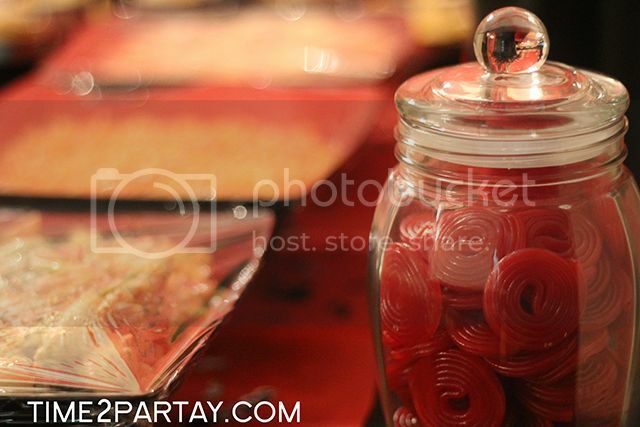 Everything on the sweets table was related to the theme. 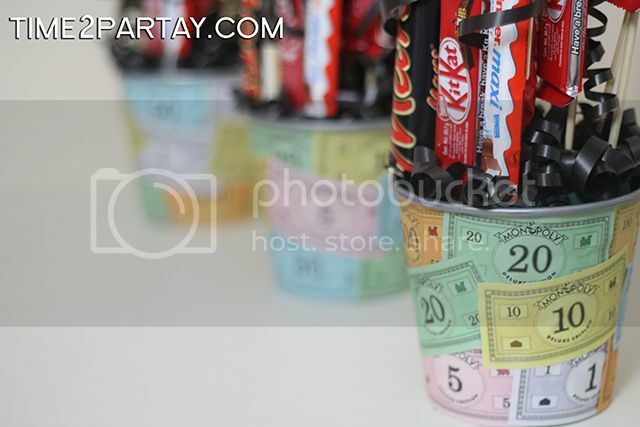 I wrapped mini chocolate bars with monopoly money. 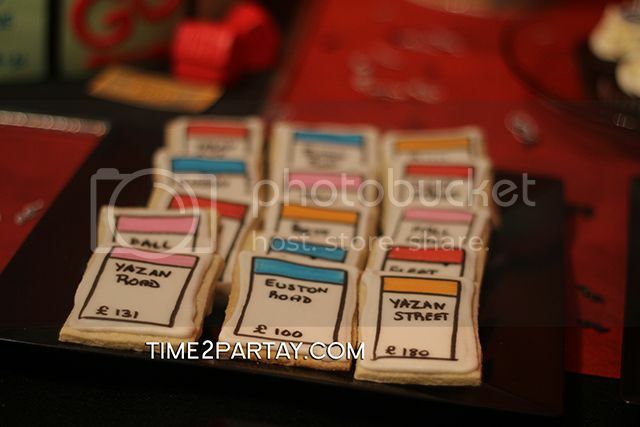 These are our homemade cookies shaped as the Monopoly properties. 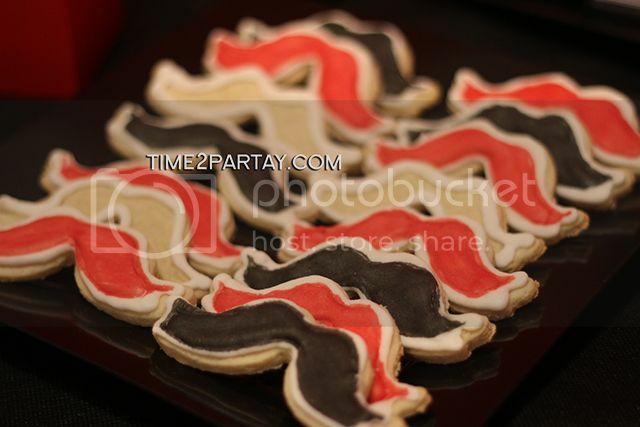 Our homemade cookies shaped as red and black mustaches. 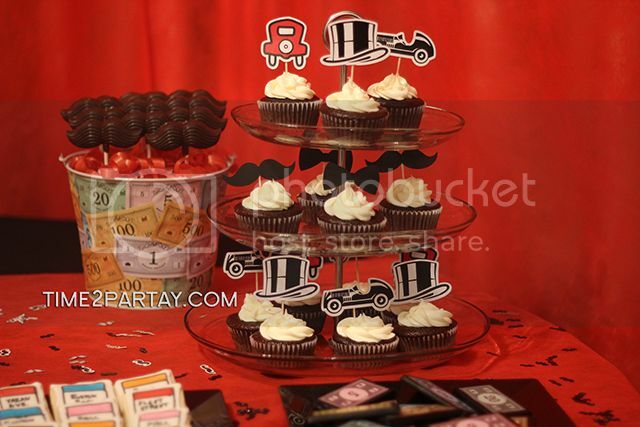 We made oreo cupcakes with Monopoly inspired toppers and placed them on glass cupcake stands. 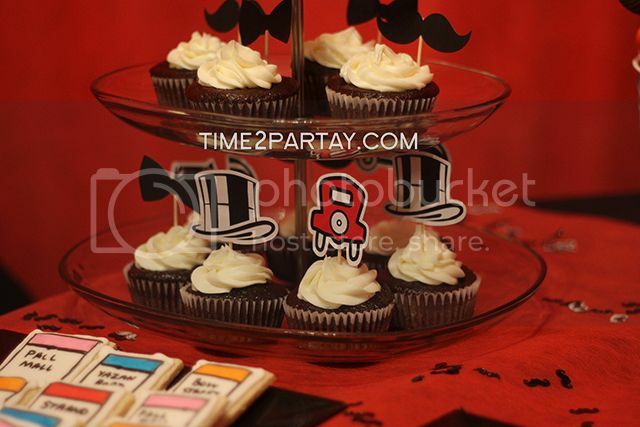 Some of the toppers were inspired from the Monopoly board. 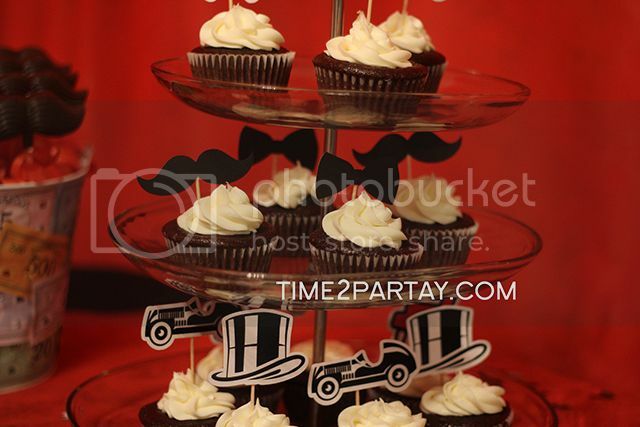 I also made mini mustaches and bows as toppers. These cupcakes didn’t last for a very long time! 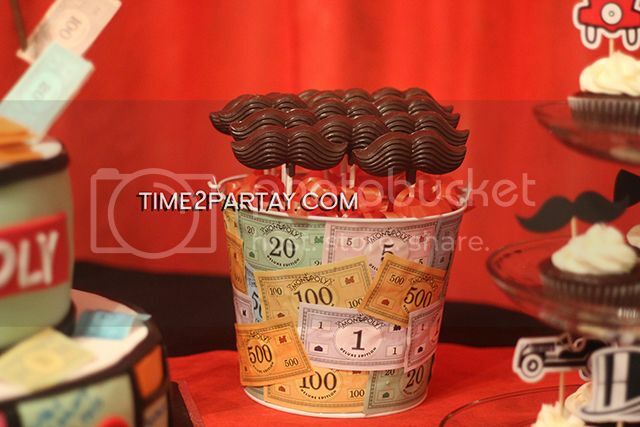 I made jars wrapped with Monopoly money and filled them up with our homemade mustache shaped chocolate lollipops. 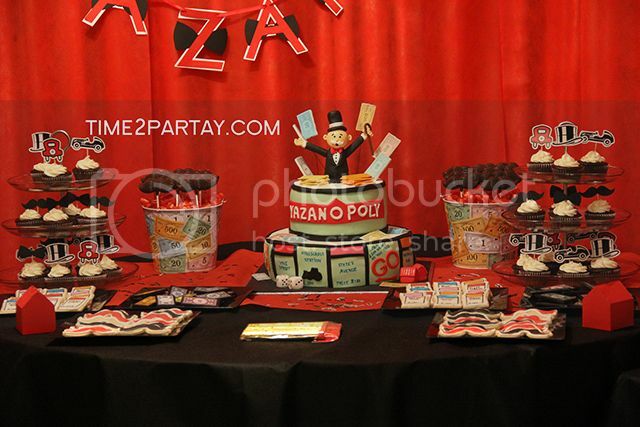 I made two Monopoly hotels and placed them as decorations on the sweets table. This was the most beautiful, delicious, and detailed cake I have ever tasted. Thanks Sukkar Cakes! 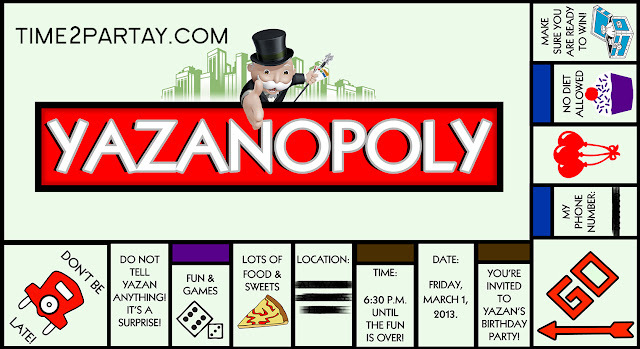 It had Monopoly, or Yazanopoly, written all over it! 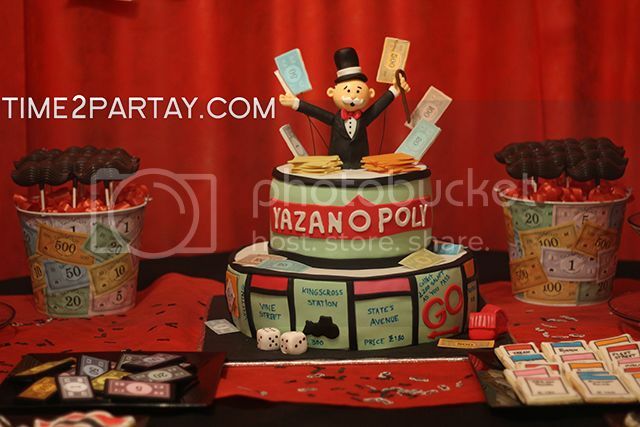 Check out Sukkar Cake’s Facebook page for more amazing cakes like this one. Even Mr. 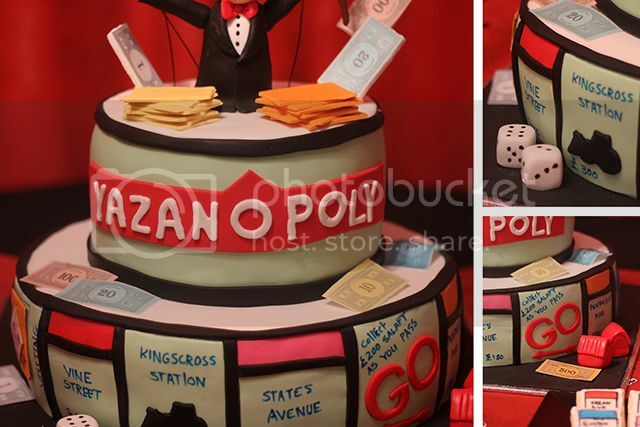 Monopoly was on the cake. Beautiful! 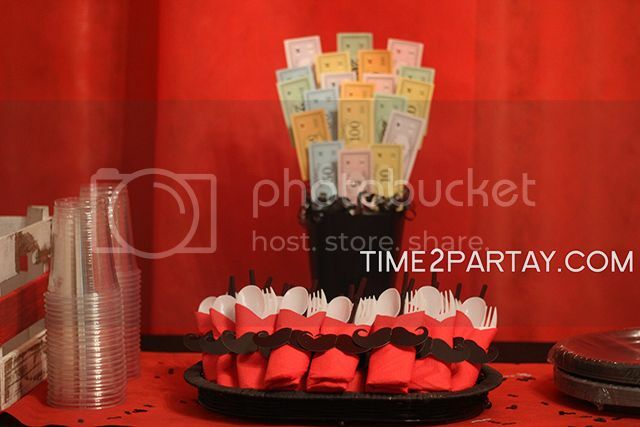 The silverware and drinks table. 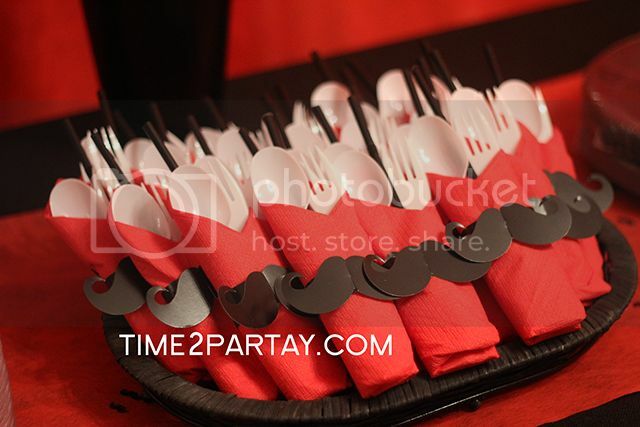 I wrapped the silverware with mustache rings. 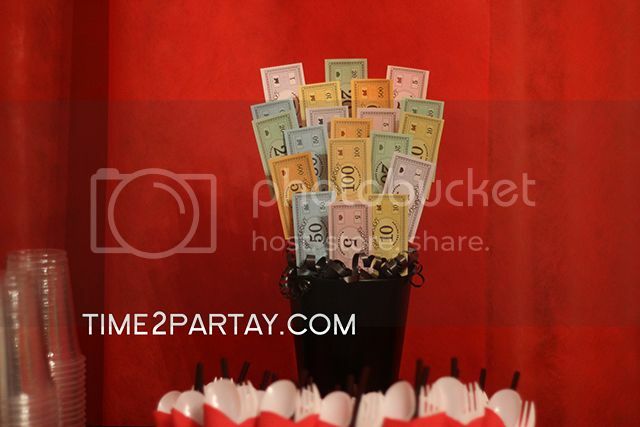 I made two Monopoly money centerpieces and placed them on the silverware table and the food table. 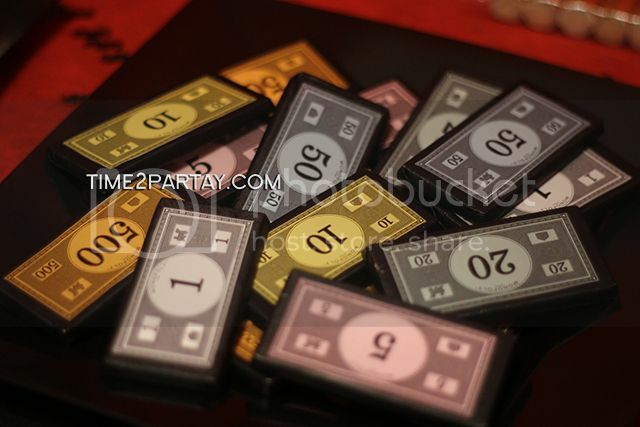 The Monopoly money centerpieces we made were very simple and elegant. It was the perfect addition to the tables. 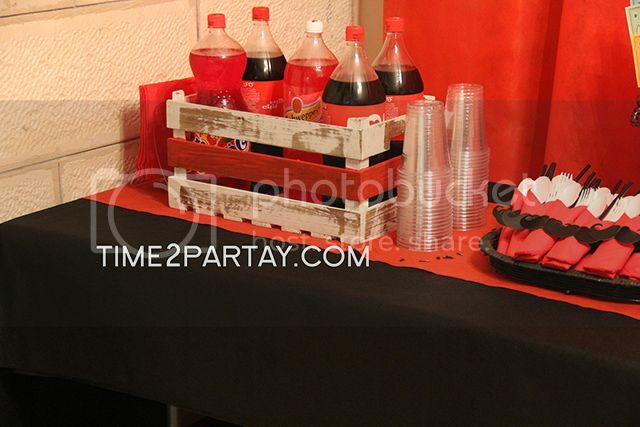 I placed the drinks in a white and red basket to keep them organized. 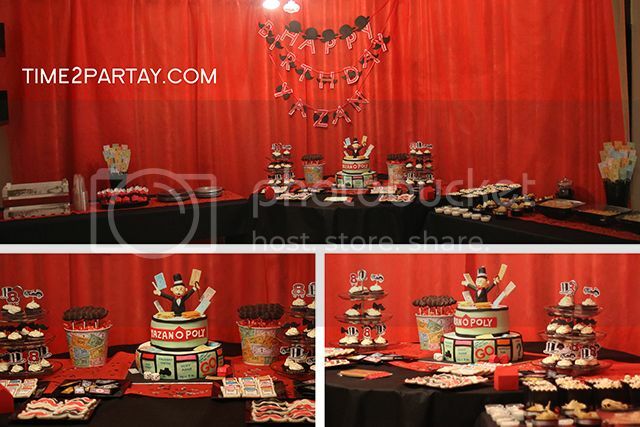 The food table. All of the food was placed on this table except for the pizza. 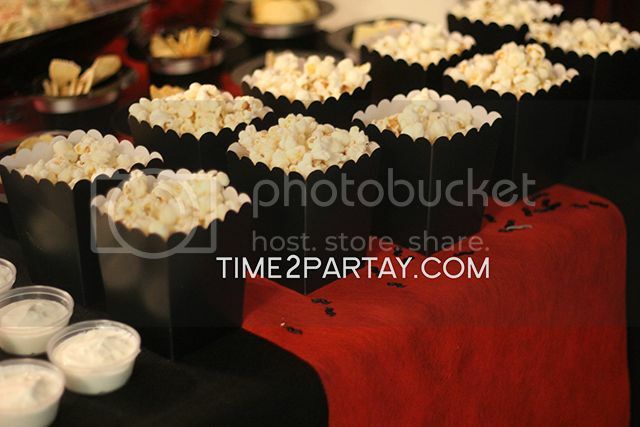 Popcorn in black popcorn boxes. 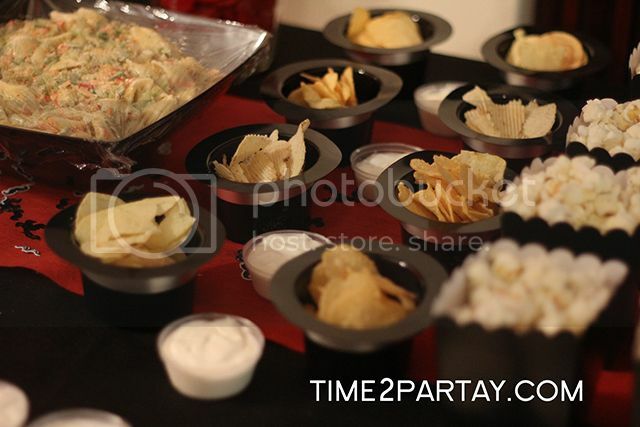 We placed chips in mini hats. 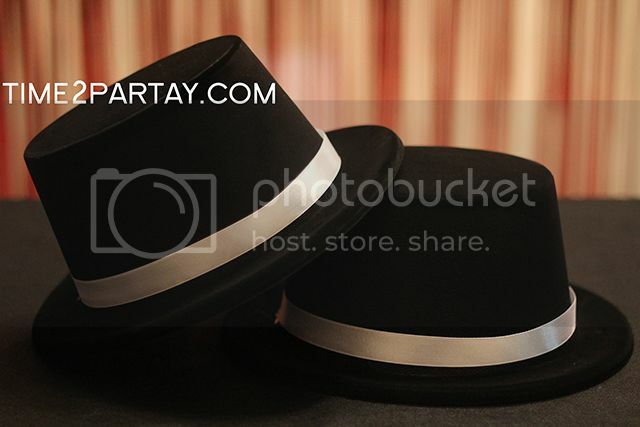 There was dip placed around the hats. Delicious homemade salads made by our dad. Thanks dad you’re the best! 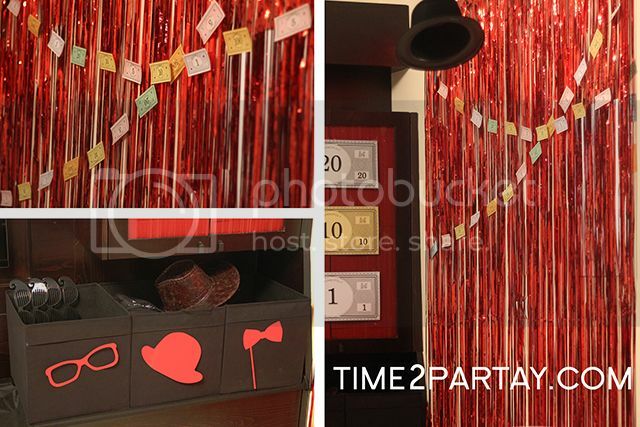 We placed red and black licorice since it’s the birthday boy’s favorite candy. 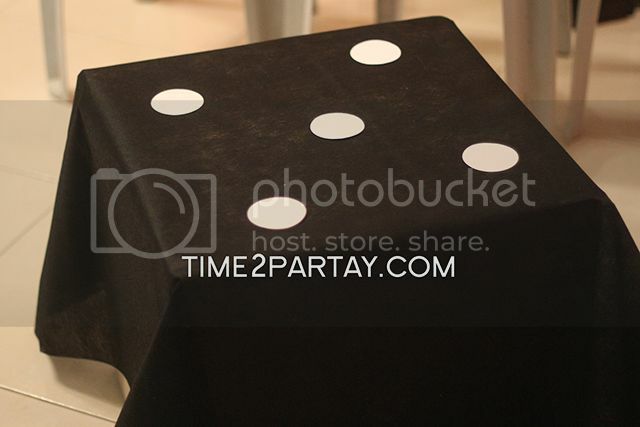 We covered the small table with black table covers and decorated them as dice. 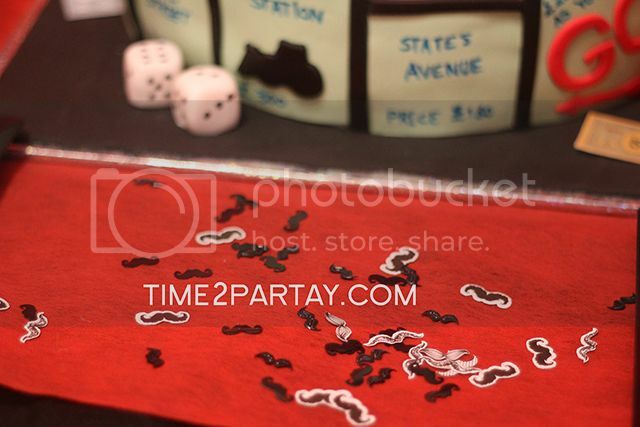 This is how the dice looked with most of the decorations that we set up. 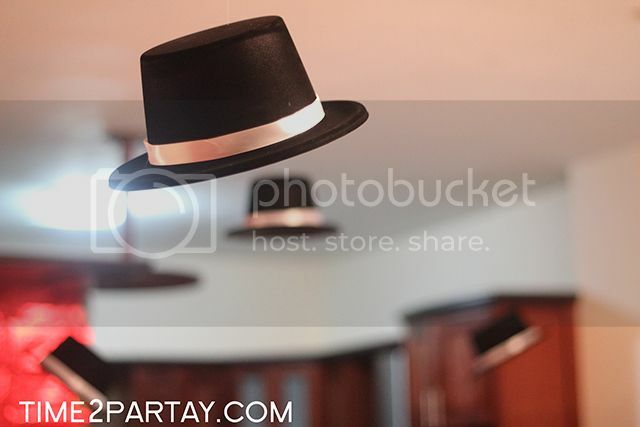 We placed some of the hats as decorations coming down from the ceiling. 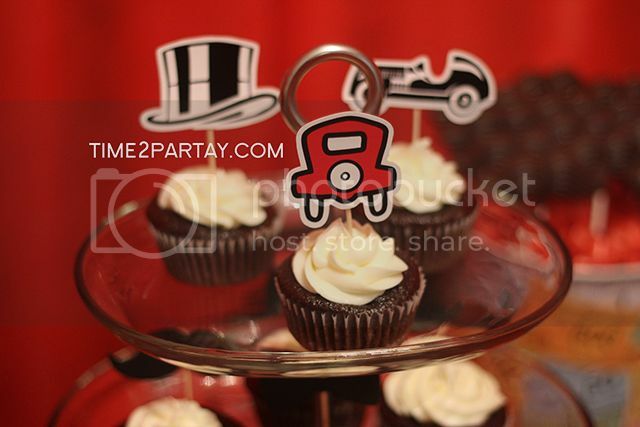 Every guest had a hat like Mr. Monopoly’s hat to wear throughout the party. 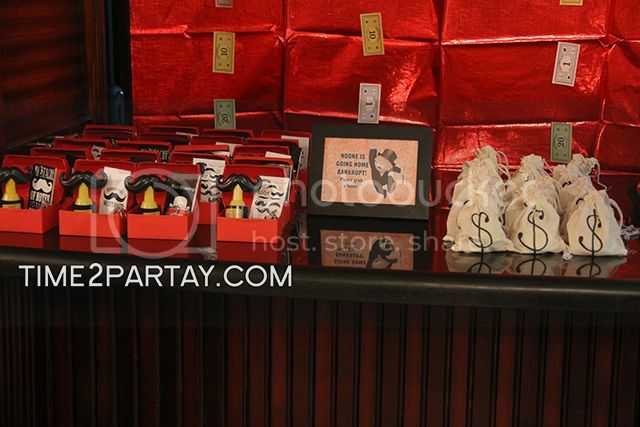 Mr. Monopoly’s hats placed as decorations. 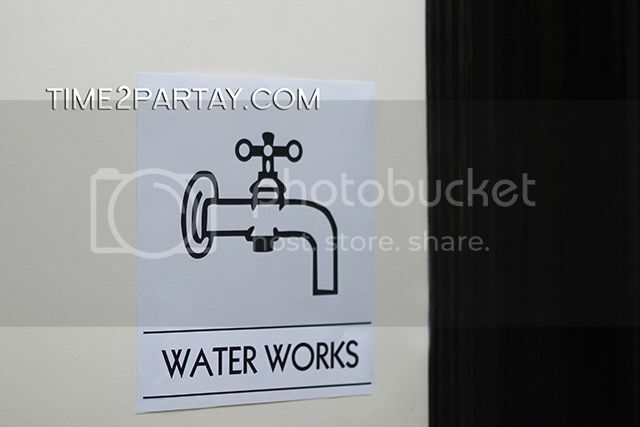 I placed a water works sign next to the restroom. 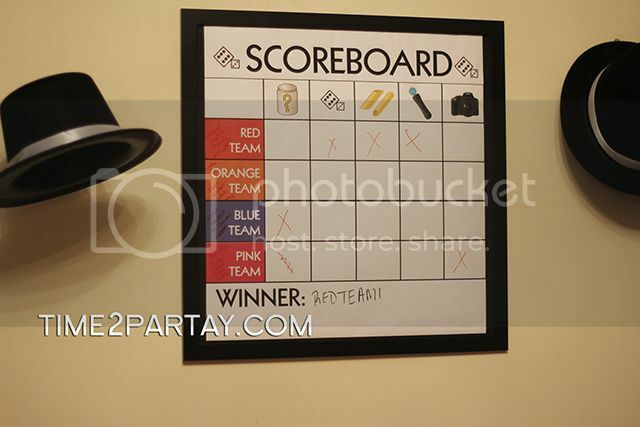 A game night theme is not complete without a game night! 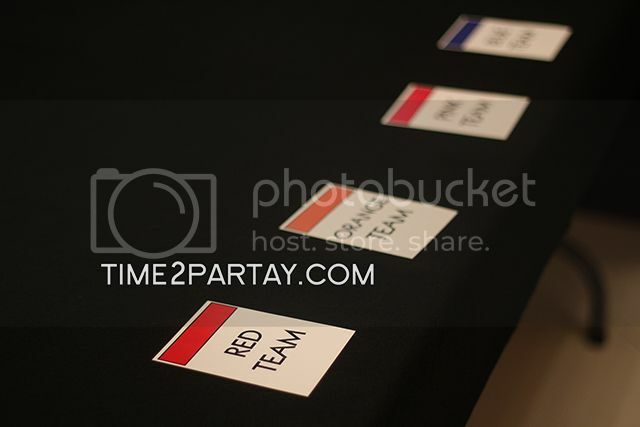 We divided the guests into 4 teams and let them compete against each other in funny games. There were 5 different games that the teams played. 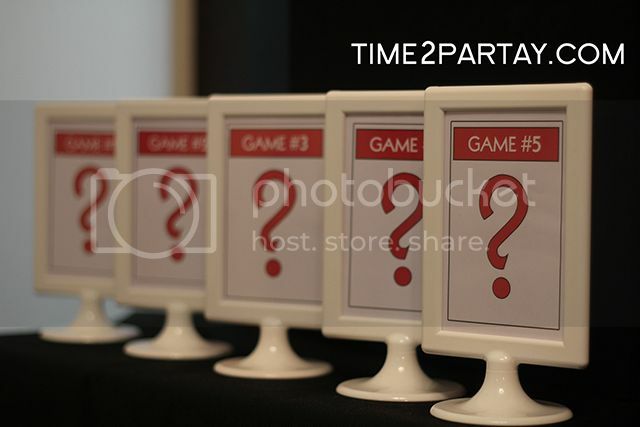 I made 5 different frames with a question mark like the chance cards on one side and instructions on the other. 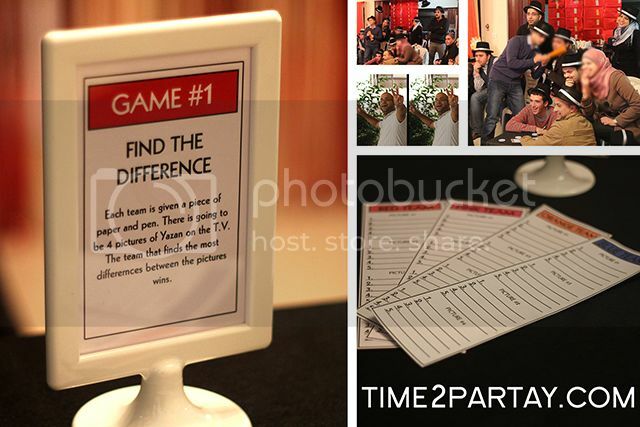 Game #1: The team that finds the most differences between the pictures wins a point! 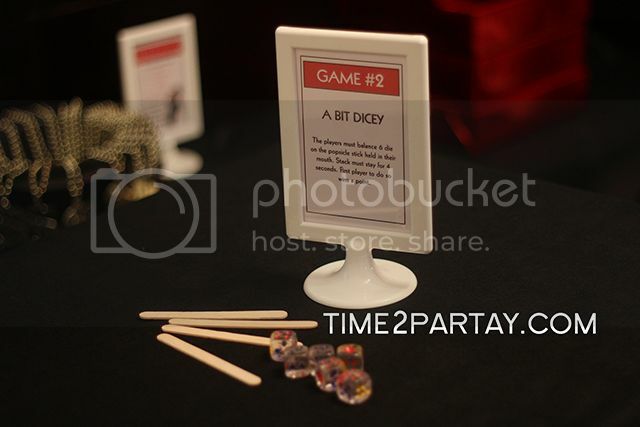 Game #2: One player from each team had to try to put 6 die on a popsicle stick. The first team to do so wins a point. 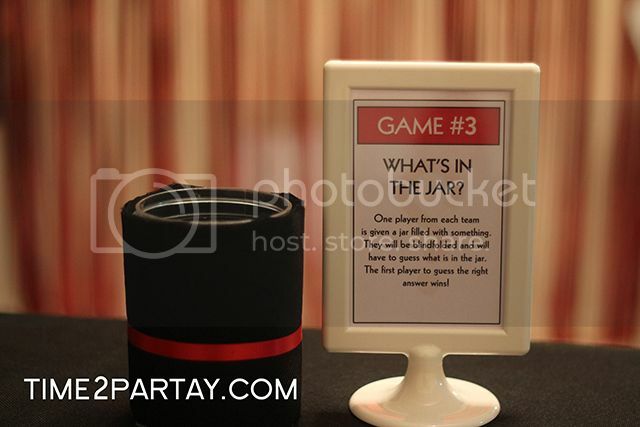 Game #3: A player from each team had to figure out the type of chocolate that was in the jar. First team to do so wins a point. 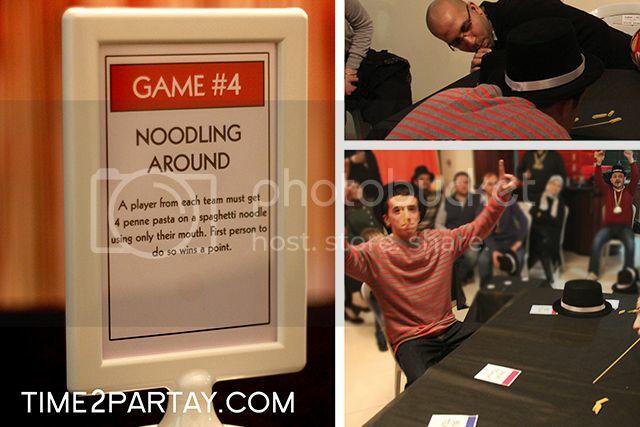 Game #4: A player from each team had to put 4 penne in a spaghetti noodle using only their mouth. 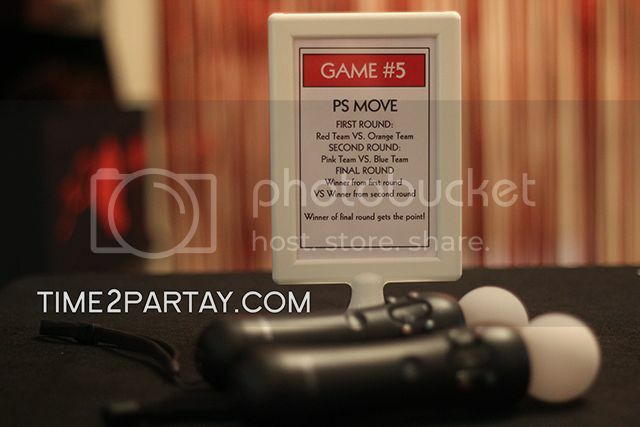 Game #5: Ping pong game on the Playstation Move. 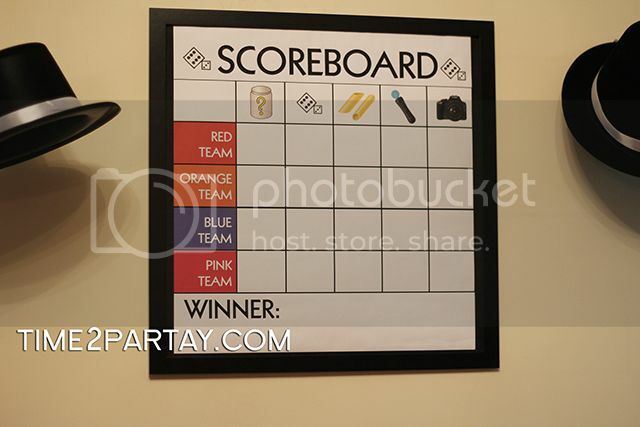 I made a scoreboard to keep track of each team’s progress. We made a chocolate bouquet for each winner to take home. 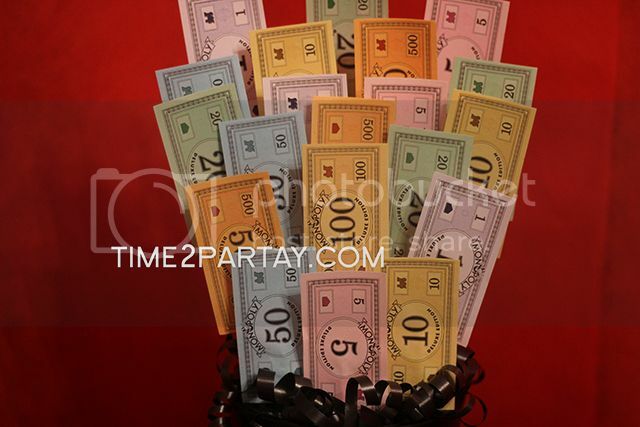 We covered the vase with Monopoly money and added chocolate to it. 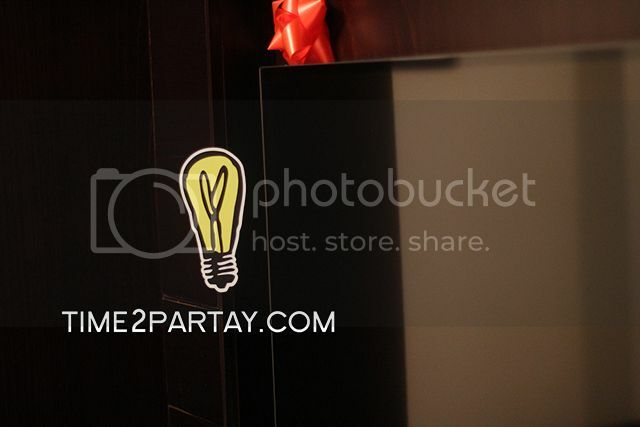 We added the gifts, some activities, and photo props in this section (including decorations of course). I made some large Monopoly money that matched his age. 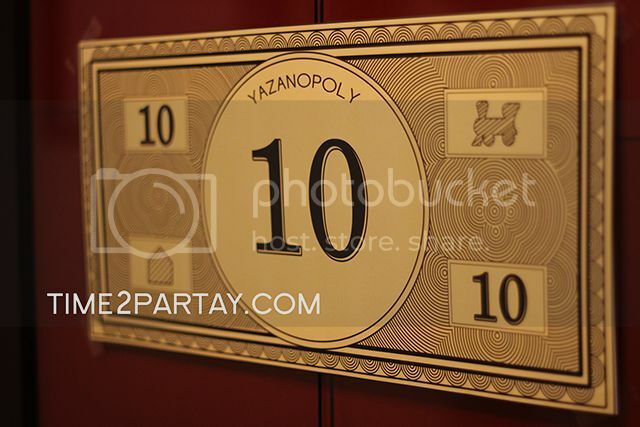 This money was personalized as “Yazanopoly” money. 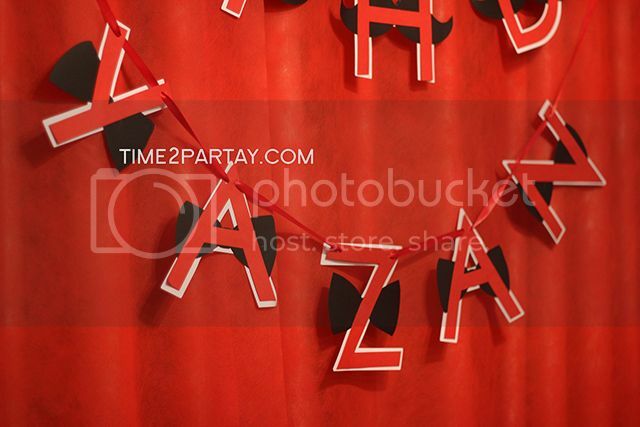 We added 3D red letters as decorations. 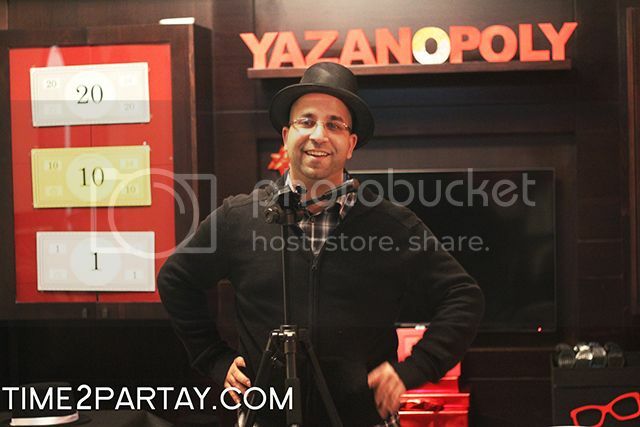 This was the best Yazanopoly night! Time to open his gifts! I made this frame and added it next to the gifts. I added the “Electric Company” sign next to the tv since that was a part of his gifts. 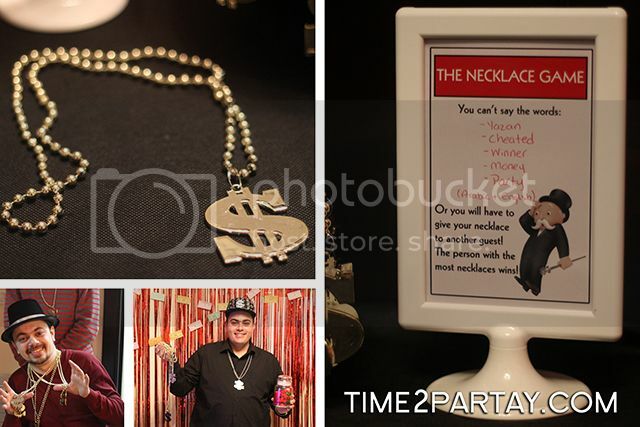 One of my favorite games is the necklace game. 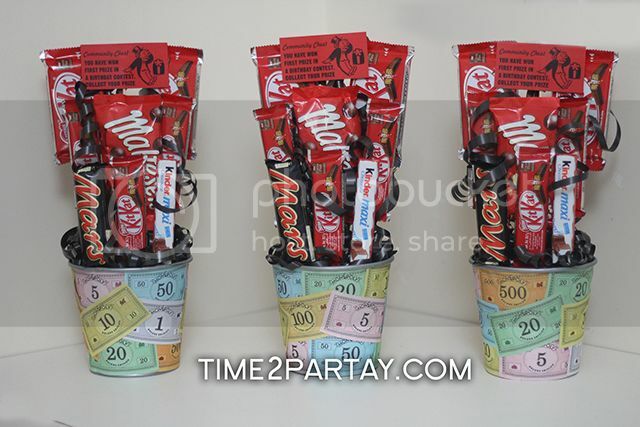 The winner got a jar filled with candy, congratulations! 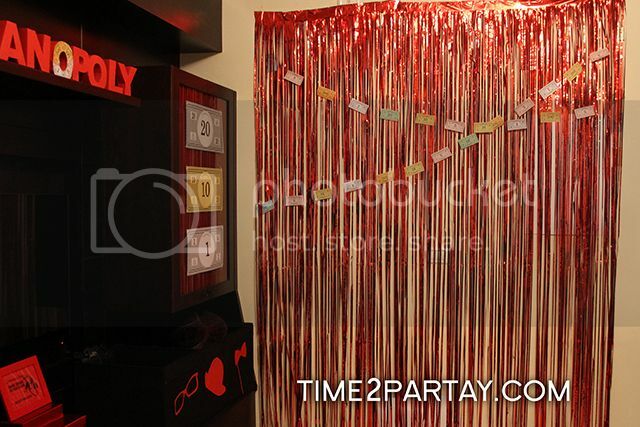 The photobooth section with the photo props. 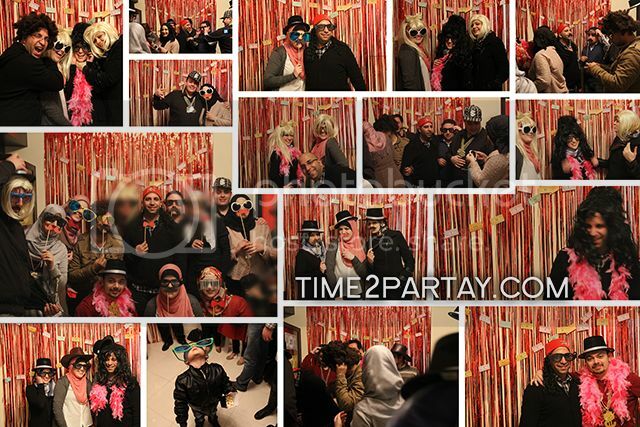 We just couldn’t stop laughing at how funny we all looked! 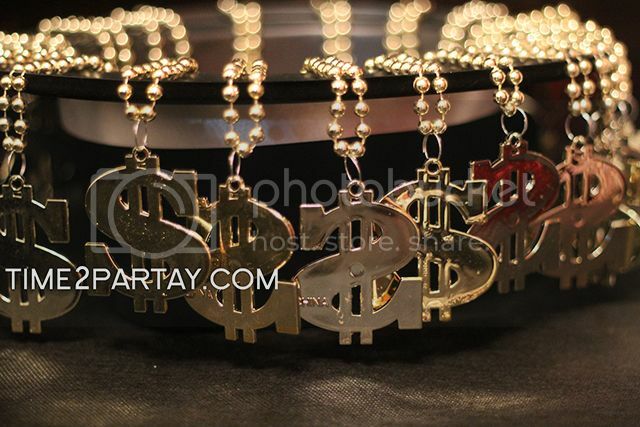 This is the favors table. This was a simple way of telling all of the guests thank you. 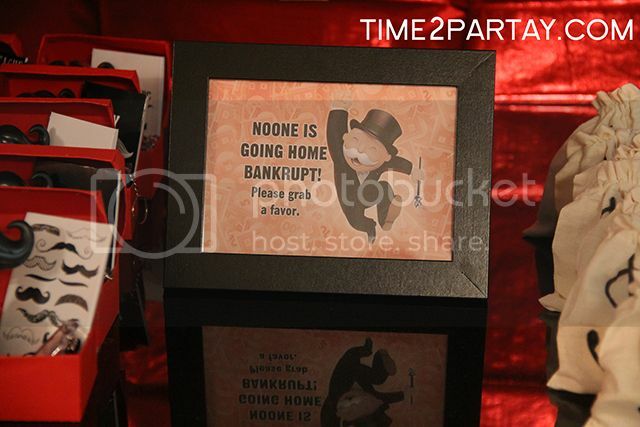 I made a frame in the middle that said “Noone is going home bankrupt! Please grab a favor”. 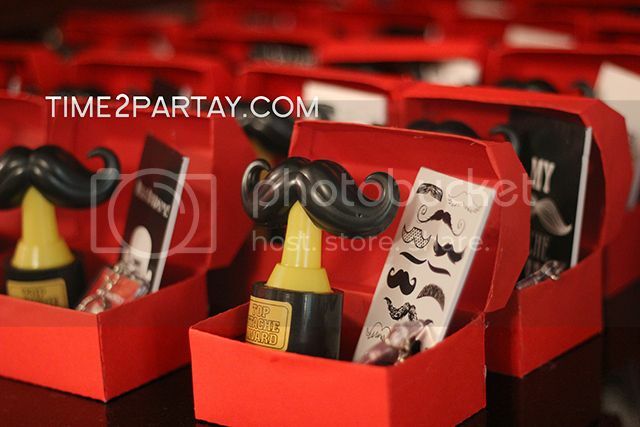 The favors were made up of two parts. 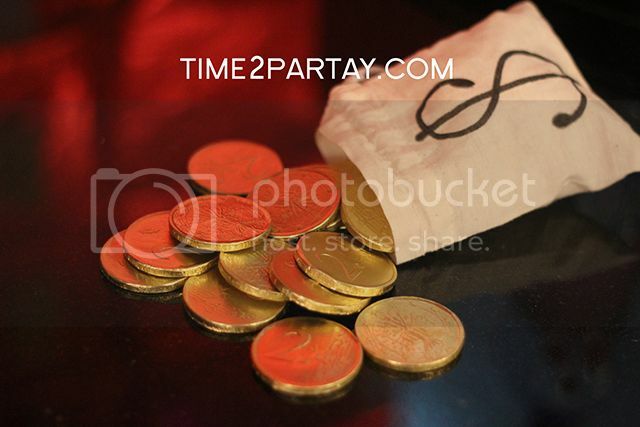 The first part was a money bag filled with chocolate coins. 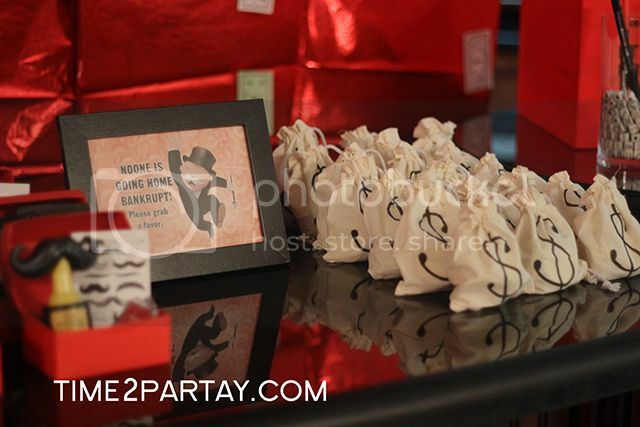 One of the favors were money bags filled with chocolate coins. 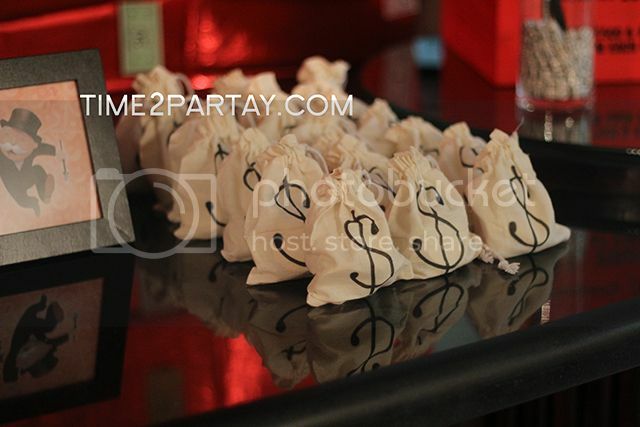 The chocolate coins in the favor money bags. 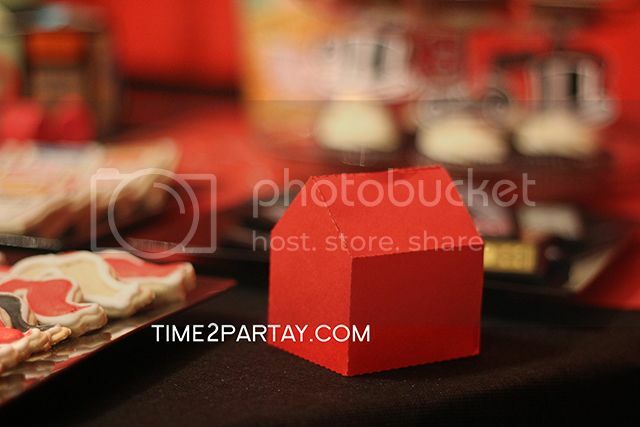 The second part of the favors were these red “Community Chests” that I made and filled with goodies. 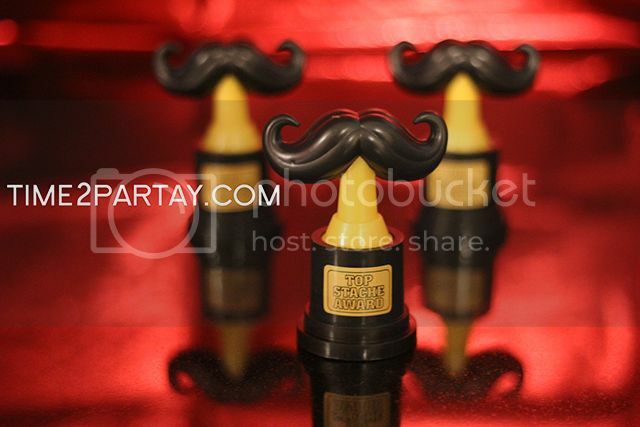 There was a mustache themed trophy in each favor chest for all of the guests. I made sure that the winners and losers all went home winners. 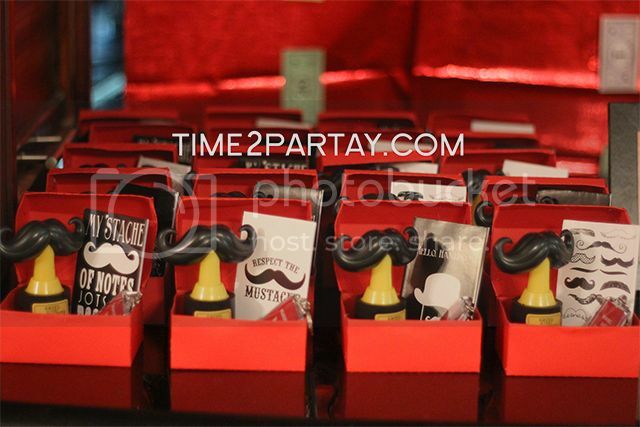 I also added a mini mustache notepad in each favor chest. 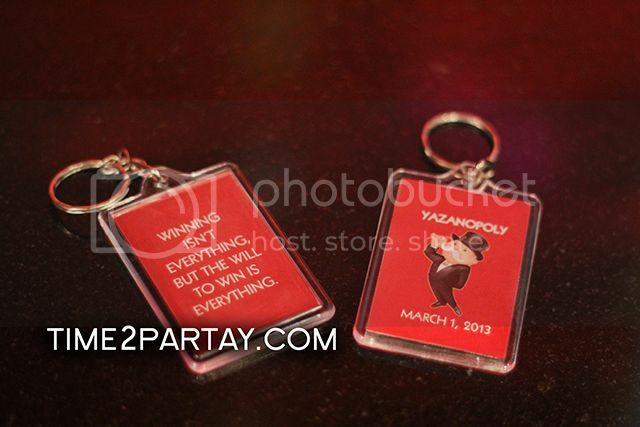 Each guest also got a keychain like this one. 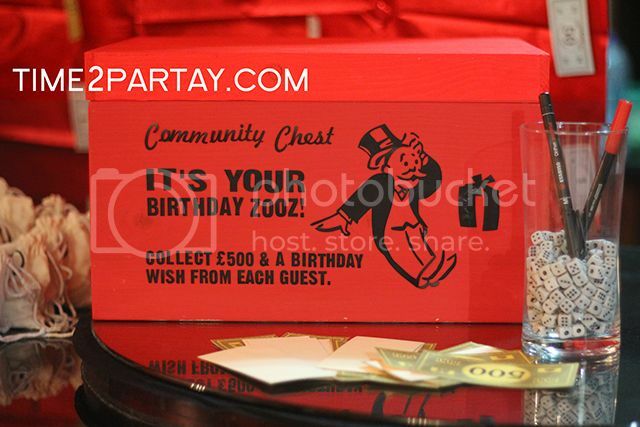 For the guestbook, I made a large red “Community Chest” for people to write in. 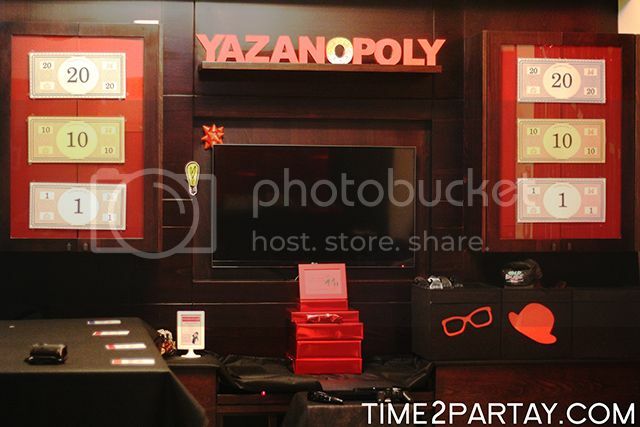 I made it large enough for Yazan-opoly to save memories of the party. 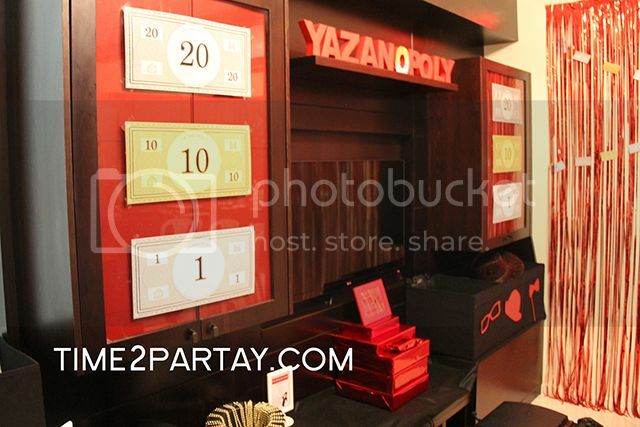 Each guest had to give Yazan-opoly money and a birthday wish. 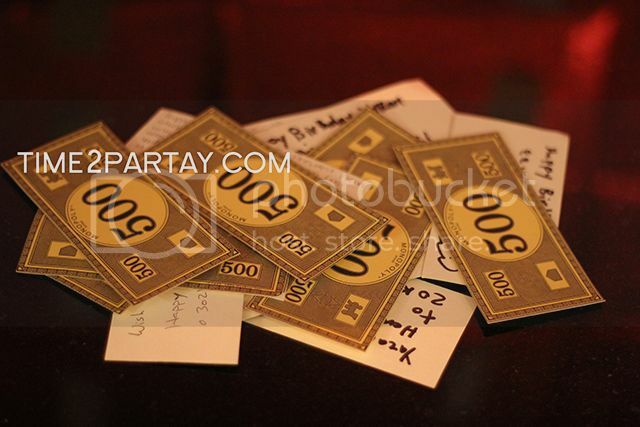 Can you tell me how you made the monopoly invitations?